This page is not an attempt to bring all of Franciscan spirituality into one place. It is only an attempt to gather some of it. 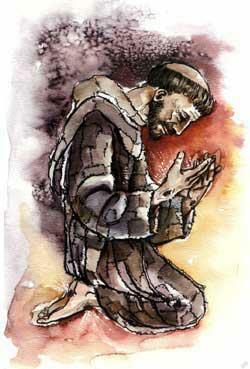 Franciscan spirituality may be found throughout all the pages of this website and beyond. See the Resources page for lists of many excellent books and other pages. All of these are highly recommended along with the writings of Saint Francis and Saint Bonaventure. Much can be found in the four volume set Francis of Assisi, Early Documents. God is good. God is humble. This is the beginning for Franciscan theology. Saint Francis entered into the mystery of God and found these two attributes. In humility God bends over to embrace the world in love, accepting us right where we are, dwelling in the brokenness of our own lives. God is good, supreme good, totally good. Four basic aspects of the Franciscan Charism are the Crib, the Cross, the Cup and Creation which are presented in the subpages to this page. There is also a subpage on Lady Poverty. and a love that is universal. according to Your light and in conformity with Your will. “We are mothers, when we carry him in our heart and body through divine love and a pure and sincere conscience; we give birth to him through a holy life which must give light to others by example.” Source: Exhortation of Saint Francis to the Brothers and Sisters in Penance by Saint Francis. without Whom there is no good. the depths of Your judgments. and striving to help everyone in You. past, present and to come. You are the Father’s own. Blessed are the poor in spirit, for theirs is the kingdom of heaven (Mt.5:3). There are many people who spend all their time at their prayers and other religious exercises and mortify themselves by long fasts and so on. But if anyone says as much as a word that implies a reflection on their self-esteem or takes something from them, they are immediately up in arms and annoyed. These people are not really poor in spirit. A person is really poor in spirit when he hates himself and loves those who strike him in the face (cf. Mt.5:39). The Admonitions, XIV. Where Francis begins to differ from other saints/founders, is in his approach to Jesus. Where most seek to emulate one or more aspects of Jesus’ life, Francis becomes totally immersed in the reality of “all” of Jesus. Ultimately, the spiritual goal of a Franciscan is to struggle to become a total imitator of Jesus, to become “alter Christus” (another Christ) touching all of God’s creation as Jesus did. This is no small goal or challenge, but a path that will ask you to look deeply into how you set your life’s priorities, and how you live them out day to day. And let us praise and glorify Him forever. praise, glory and honour and blessing. honour and glory and blessing. Bless the Lord, all you works of the Lord. Let heaven and earth praise Him Who is glorious. and in the sea and those which are in it. all honour, all blessing, and all good. So be it! So be it!